Looks like there is some potential for severe storms to develop from Saturday through to Tuesday and at this stage Sunday/Monday is looking the best in my opinion. Monday is showing the possibility of reverse hodographs over the Northern Central Tablelands & Upper Hunter districts with deep South East lower level winds over topped by South Westerlies from 500mb upwards. Sunday afternoon has stonger CAPE potential with values of 2000+ in a very focused area west of Lithgow. What do others think? 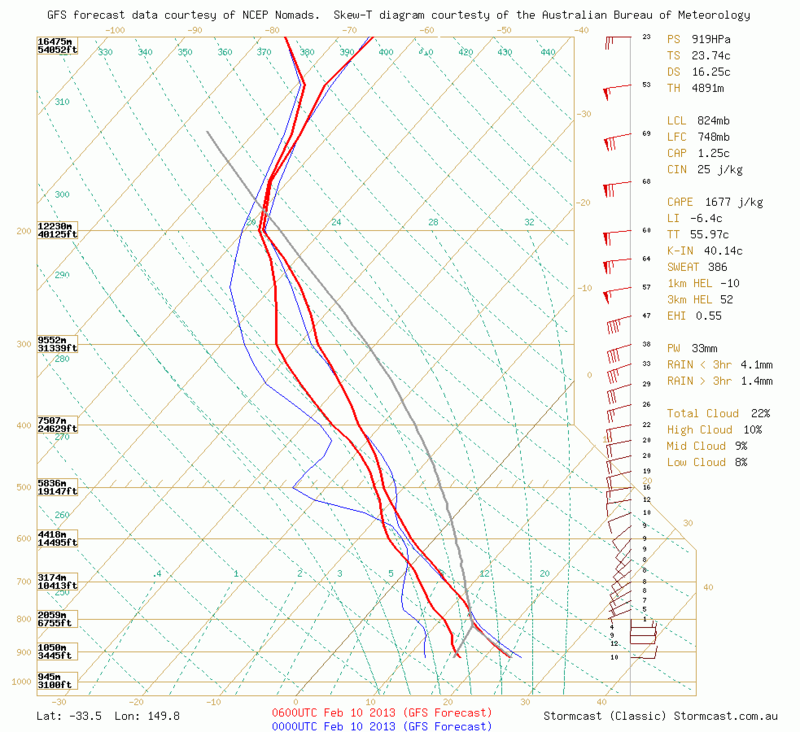 Forecast sounding for the region near Bathurst. Not too bad. Hi Jeff Brislane, totally agree and have been watching this for some time – probably about a week though the latest models have enhanced the probabilities. I will definitely chase this event if it unfolds as we get closer! Posted the sounding for people to see for the day and also some model data for Sunday. At least a local chase. Some decent storms this afternoon near and around Lithgow. 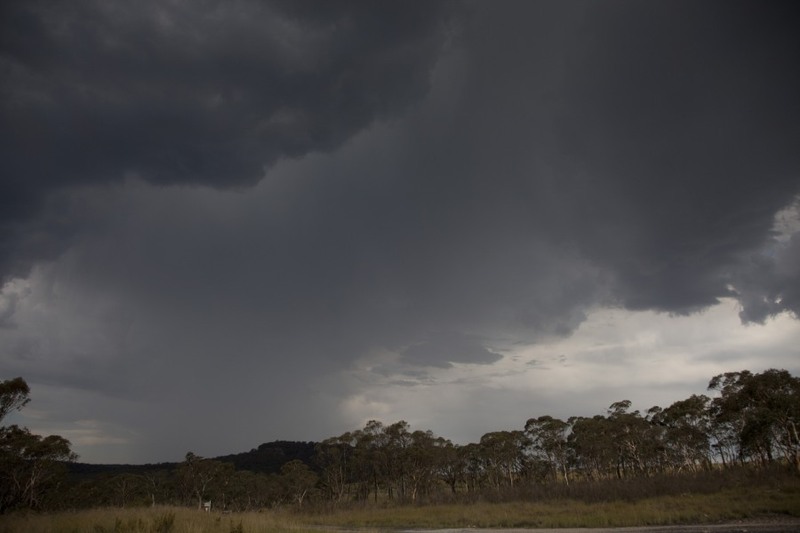 A warning was issued for severe storms – hail, heavy rain and wind for the Central Tablelands for an hour or do. Has the potential to come close to Feb 7-2007. Lookout! But seriously I’m thinking the best place to be tomorrow is around the lower Hunter and to Nelson Bay. Sydney will no doubt get some action but i think the best stuff will be a bit further north. I’m not sure how the South Coast will fare, the cap is much stronger down there. We'll see about Saturday Jeff Brislane. If you wish to chase, let me know – pop over and we can chase in one vehicle! According 2 the models, I think there's potential 4 a repeat of the February 2005 supercells in NSW and the Sydney region. There seems 2 b high CAPE and good shear. Looks like there will b good moisture boundaries too. I have seen the models. I may even head down to the southern Tablelands to see what happens today and Sunday is looking promising. 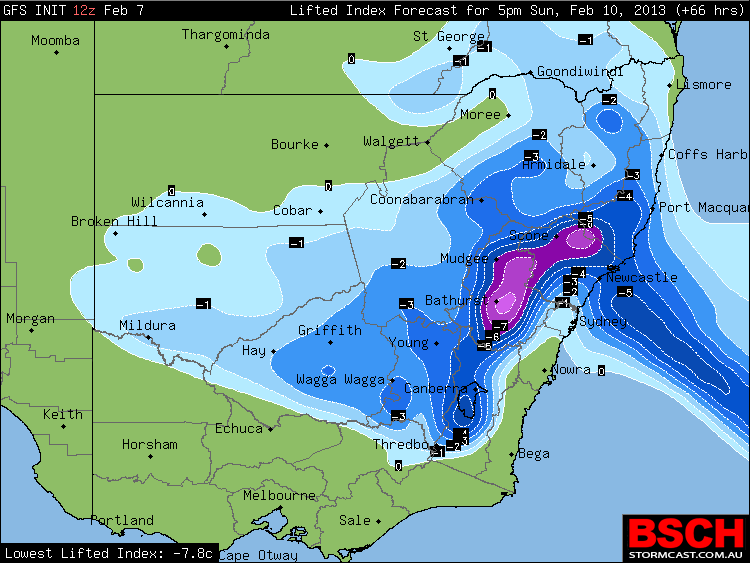 I am making myself available for a storm chase Sunday and may target the Lithgow area. At least it is not too far from Sydney. Not so sure about the 2005 and 2007 supercell outbreaks.. those setups were much more complex than this. Feb 2005 you had your curved jet and incredible turning, Feb 07 also had a nice LLJ and fantastic upper level shear. This setup has none of those. However there could be some nice storms on the ranges today, and tomorrow is obviously looking the best for these parts. While shear is hardly amazing, the SE may provide some great convergence in the SW. I am tipping some biggies around SW Sydney, Colo and Putty. Can't chase though unfortunately. I’m not chasing far today simply to save some money for tomorrows chase. Today, i’ll have anywhere from Nowra to Nerriga or Nowra to Ulladulla covered. Just sitting at Nowra Hill now. Excellent views in all directions. Convection is widespread and very high based but a few a trying to organised to the west. Tomorrow I will play the Bells Line road. Yeah, very limited window for surface based storms in western Sydney during the early afternoon. Otherwise, best option seems to head over to the accessible parts around Lithgow, and the region where there is 'stronger' mid-level flow around 4-6pm, where the should be some intense storms possible supercells. Went out for an unexpected chase today. Really went for an observation of the storms over the mountains and ended up getting a phone call from Kiim can she work late. I said yes! A phone call from Harley sealed the deal and I was off over the ranges. I was not expecting too much but the bases were not as high as I was anticipating! I ended up getting a hailstorm north of Cullen Bullen. I did not get the opportunity of chasing the storm further north since I had to get back and pick Kim once more from work. Here is the first cell in a weakened state after Harley intercepted it. Base of the developing hailstorm almost overhead. Cell to the north that may have been the storm that tracked along the highway to Mudgee. Another look at the cell to the north of Cullen Bullen on the 9th February 2013. I love 2 c what happens later when that uppel level cold pool and trough line makes it's way towards the coast. Could b the best storms we've seen 4 ages. I saw this in the distance looking north. I was at a lookout near Lithgow paying more attention to the southern storm as that one kept producing new updrafts. Where I was, that cloud tower took on a more orange look, more to do with distance and possibly haze. It was a very nice updraft tower. 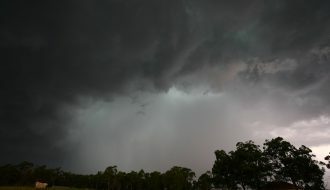 This was the storm I intercepted and I was watching this at a lookout near Lithgow. Just prior to this, I intercepted the base of an earlier storm at Mt Victoria and was stunned to have hail fall. One very isolated stone was approximately 2 cm in size. After it bounced, I retrieved it and photographed it. I saw a small number of cloud to ground lightning from this cloud. I chased the Blue Mountains – Katoomba to Cullen Bullen area Saturday afternoon. Just after 1 pm, I had a look to the west and saw the first convection cloud towers starting to build. As I was ready to go for a chase and cameras in the car, I left Blacktown quickly and followed the M4 Motorway up to Katoomba. 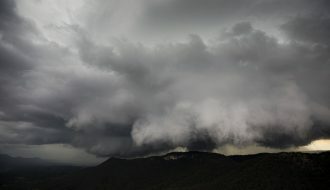 I discovered that the storm cell building near Katoomba was sustained and the cloud towers kept consolidating. The cell held together long enough for me to get up there. I was fortunate too for having light traffic flows so I was able to get up to Katoomba, then Blackheath, then Mt Victoria fairly quickly with few delays. The storm cell I saw earlier had peaked by the time I reached Mt Victoria but I still had time to take photos at some vantage points. I managed to take photos of a good base that passed over me. I also saw a small number of cloud to ground lightning strikes to the south and west. I made contact with Jimmy while I was near Blackheath alerting him to these storms and providing some guideance and behaviour of the storm cells. I found the storm was moving NE slowly but the base was reasonably solid and dark. I never expected some hail at Mt Victoria. 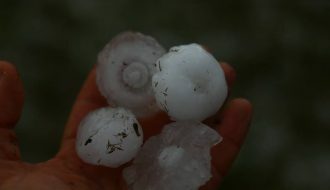 While most hail was pea sized, an isolated larger stone bounced near me. I retrieved it and found it to be at least 2 cm in size. I photographed it. That storm was going into decay thereafter. After more discussion with Jimmy by phone, I made my way to Bell, then to a lookout near Lithgow. 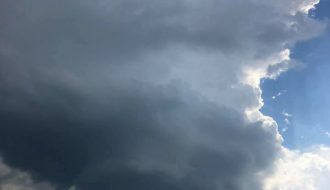 The first storm had decayed but new storms were building close by and I discovered a new storm was building on the western side of the earlier cell. I took numerous photos of the storms and some of mine are similar to the ones Jimmy has posted. At Lithgow, I had to refuel my car and spent some time working out which storm to approach. There were two storms being a northern one and a southern one. The northern one had a solid base but the southern one was producing cloud to ground lightning which also had a reasonable base. I moved to the west of town, saw that I could get to the northern one and drove towards Cullen Bullen. During that drive, a saw one strong lightning flash that pulsed and a few others. I met Jimmy at Cullen Bullen. After watching another storm which produced a good mid distance cloud to ground lightning strike, we drove back to Sydney. I enjoyed this chase and some very nice cloud towers observed. It seemed to be a day where storms were small and one had to move very quickly to get the hail and downpours. Storms were hit and miss and localised. 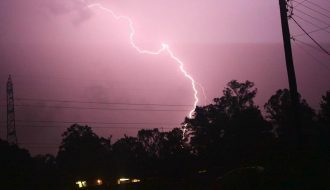 Overnight, there was some lightning to the west of Blacktown and a storm cell which did not make it to the coast. I will post photos as soon as I work on them. The base of the storm at Mt Victoria. The base is overhead. Again, cloud to ground lightning was observed from this. The hail fell from the base. I observed this isolated 2 cm hailstone fall. After it bounced, I managed to retrieve it and photograph it. The hail was sporadic. Most was smaller pea size. Storm builds to the south west. 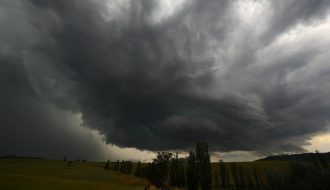 This was the storm I was watching from Lithgow and photos are similar to the ones posted by Jimmy. I am just east of Lithgow taking these looking to the west south west. Check out the sounding for last night! Jeff alerted me to the Sydney sounding which was for last night I guess. Extremely unstable but elevated too given the cap/CIN. I did, looks like n upper cold pool moving across. I just checked it then, it looks very impressive! A major storm event could b on the way 4 Sydney today. I'll b checking the radar and having my camcorder charging. Nice green base it seems – the bases did try to tap into the moisture in this region of the storm you just posted Harley. 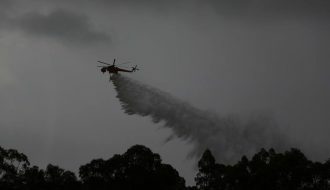 Was any1 chasing near Lithgow today? Looks like they copped it again and also a possible supercell 2 the northwest of Lithgow heading northwards as I speak. Here are a few more photos of the storms to provide a more complete picture of the days events. Prior to the storm passing over Mt Victoria, there were storms across the eastern side of the Oberon Plateau with some rain shafts. They were the early storm cells for the day. They were high based. The storm that was to pass over Mt Victoria looked like this early on. It tapped into some moisture around Mt Victoria with a lowered and expanded base. The base prior to it’s main development before it passed over Mt Victoria. I am looking south. The other photos already provided follows on from this. 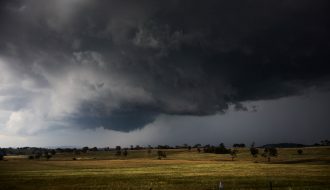 I provide one more image of the storm cell at its peak from near Lithgow showing the solid updraft towers. I took a number of these before I went into Lithgow to refuel and eventually continue my way towards Cullen Bullen. This developed on the NW side of the earlier cell that passed over Mt Victoria. Hence, when I arrived at the location to take this, the storm cell as shown to the south west was maturing. I have provided a second photo of the cell (above) showing the storm much later in its development. Feb 07 also had a nice LLJ and fantastic upper level shear. Are you sure? Where do you live Murray John? I don’t recall the February 7th, 2007 supercell as being part of an outbreak. You might be mistaking it for another year.